Often called obligate or preferential nasal breathers, infants show a propensity for breathing through their noses. Although typically infrequent, mouth breathing plays a key role in helping keep your infant alive and healthy. Learn the facts about mouth breathing in infants--what makes it difficult, why it's necessary and how it could save your baby's life. At birth, your infant has certain physical features that tend to limit mouth breathing and promote more rapid feeding. These features include a larger tongue, smaller mouth and elevated larynx. Additionally, according to Annie Bagnall, contributing author in the book "Feeding and Nutrition in the Preterm Infant," the epiglottis -- which closes off and protects the windpipe--is extremely close to your infant's soft palate--the flap of muscle located at the back of the roof of the mouth. This proximity allows your infant to switch between nursing and nasal breathing more quickly. At the same time, it makes mouth breathing more difficult. During the first few months of life, most infants breathe through their mouths only when crying. Around the age of 6 months, rapid physical growth moves the soft palate and epiglottis farther apart, which allows your infant more freedom to breathe through the mouth. Although they can alternate effectively between nasal and mouth breathing, normal babies over the age of 6 months generally continue to show a preference for nasal breathing. Because infants usually prefer to breathe through their noses, mouth breathing could be a sign of upper airway problems. According to John Douillard, Ph.D., author of the book "Mind, Body and Sport," infants breathe through their mouths if they are unable to breathe through their noses. During early infancy, before the soft palate and epiglottis move apart, nasal obstruction makes your baby cry. The act of crying brings air into the lungs through the mouth. In certain cases, your newborn infant's ability to mouth breathe on a regular basis could help save her life. Choanal atresia--the most common nasal abnormality present in infants at birth, according to Medline Plus--is characterized by the presence of tissue that blocks the opening of one or both nostrils. Infants suffering from blockage of both nostrils can only breathe when they cry and often have bluish skin resulting from a dangerous lack of oxygen. Infants who can breathe through their mouths without crying may be able to wait a bit longer before having to undergo surgery to remove the tissue blockage. Nasal blockage from a stopped-up or runny nose becomes less problematic for your infant once she becomes able to breathe through the mouth on a more regular basis. Infants under the age of 6 months who avoid mouth breathing may experience breathing difficulty when suffering from these nasal problems, which often arise from common illnesses like colds. 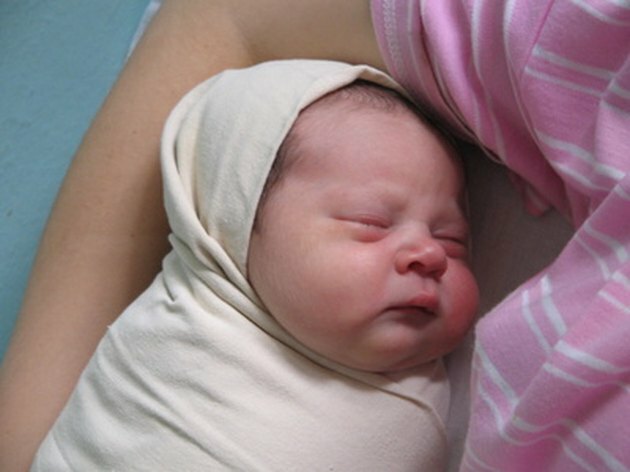 Provide comfort measures if your infant has a cold and seems to be having trouble breathing. Two common remedies include removing excess mucus from the nose with a bulb syringe and thinning nasal secretions with saline nasal drops.